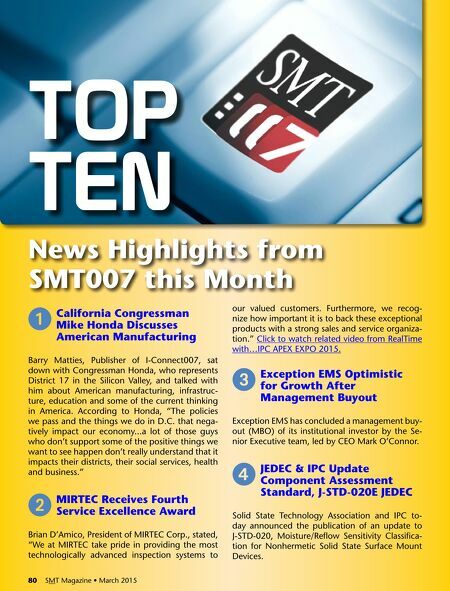 March 2015 • SMT Magazine 81 5 ImI's 2014 revenues Up 13%; Expects Growth to continue "The year 2014 was a banner year for IMI as we outperformed the eMS industry's single-digit growth rate and our financial targets. our global presence and market diversity took advantage of the recovery of the international markets and elec- tronics segments," says Arthur Tan, IMI president and chief executive officer. 6 key Tronic Enjoys 46% revenue Growth in Q2 FY 2015 As expected, the company had a strong sequen- tial improvement in operating efficiencies. for the second quarter of fiscal year 2015, gross margin was 8% and operating margin was 2%, up from 5% and (2%), respectively, in the first quarter of fiscal year 2015. 7 cTS reports Earnings Growth, Progress on Business Wins "We are pleased with the results for 2014. We de- livered strong earnings growth despite softer than anticipated sales," said kieran o'Sullivan, Ceo of CTS Corporation. 8 nOTE's 2014 Sales Up 6% Despite Weaker Sales in Q4 "In 2014, we advanced against the competition on a fairly stable european market. We regard our sales performance in Q4 as a temporary decrease, our strong order backlog at year-end indicates a positive volume performance in 2015," says noTe President and Ceo Peter laveson. 9 nEPcOn china 2015 Puts Spotlight on materials nePCon China 2015 will take place in hall 1 of Shanghai expo Center from 21–23 April 2015. The event will feature the latest technologies and products in SMT, surface welding, electronic mea- surement, automatic electronic production, static electricity prevention, and new materials. J Flextronics, STmicro Develop Plug-In charger Platform "We're happy to have partnered with the ST team in jointly developing this revolutionary charger platform with zero no-load power consumption," said nate vince, president of flextronics Power. "flextronics is focused on driving innovation and delivering high- quality and energy efficient power for our customers as they compete in a highly dynamic market." 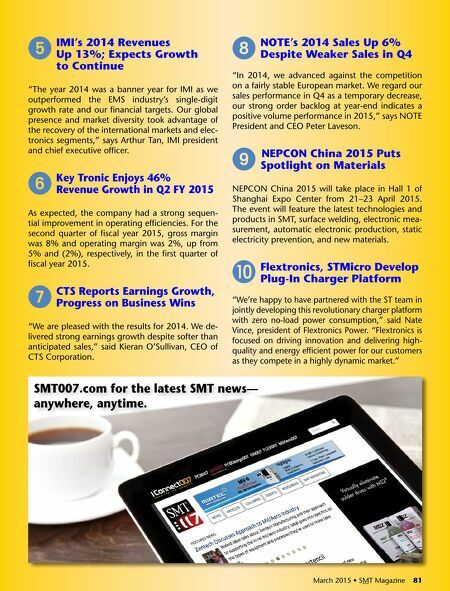 March 2015 • SMT Magazine 81 SmT007.com for the latest SmT news— anywhere, anytime.